Title: CN 2539 on M34191-31 at Stevens Point awaiting a crew change. Description: Although not seen in this pic, the engineer had a cigarette in his hand... thought that was banned in locomotives? Whatever, don't tell him I snitched, lol. Description: 385 at Paris Jct. Description: A GE C44-9W on a freight passes a Toronto-bound VIA train at Kingston, Ontario, in July 2007. 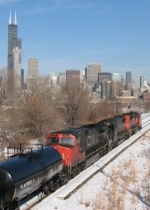 Description: CN's intermodal trains add a splash of color along the winter-brown right of way. Description: CN 250 heads south. Description: CSX Q62109 heads north. Title: busy day with 2 coal train and 1 freight train. Description: M395 comes into "Tunnel yard". Description: CN 2539 , leading train M395, pulls through "Tunnel yard" on track 3 while passing the former PH&D roundhouse and office building. Photo was taken from the former boardroom in the old PH&D office building.